Your next taxi ride to or from Inverness Airport might be in an electric vehicle, now that charging points have been installed at Dalcross. Inverness is the first airport in Scotland to have dedicated electric taxis, thanks to a funding boost. Electric vehicle (EV) rapid charge points have also been installed in the city centre to allow local firms to make the move to electric vehicles and offer low carbon transport services to and from Inverness airport. In 2017 Inverness Taxis were awarded a seven-year contract to serve the airport, and decided to explore EV opportunities. Last year, the company was awarded a loan from Energy Savings Trust and bought two electric taxis, with plans to expand their electric fleet in the future. Matthew Eastwood of Energy Saving Trust said: “Sales of plug-in vehicles have been increasing every year and we have no doubt that this trend will continue due to the substantial fuel cost savings that can be achieved. 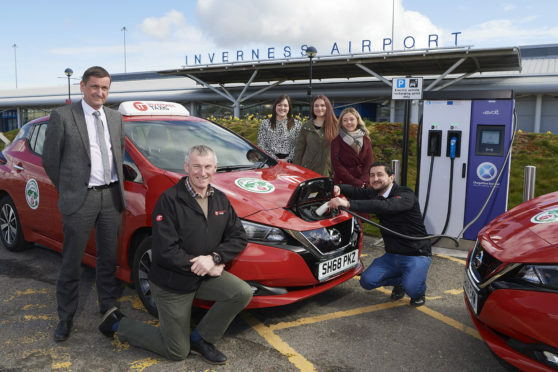 Inverness Airport general manager Graeme Bell said: “Electric vehicles are becoming more common on our roads and we are pleased that Inverness Taxis are able to make use of the new charging points. “Highlands and Islands Airports Limited (HIAL), which operates Inverness, made the switch to 100% renewable energy-backed supply in 2018, taking an important step towards reducing our carbon footprint. The project has been part-funded by Transport Scotland through the Energy Saving Trust (EST), and the SPARA2020 project – an Interreg Northern Periphery and Arctic (NPA) project part-funded by the European Regional Development Fund (ERDF). HITRANS was the lead partner of SPARA2020, with a key output being the introduction of low carbon surface access at remote and peripheral airports. HIAL, Highland Council and partners from Sweden, Norway and Ireland have also collaborated on the project.